With roasted salmon in rose butter and oven roasted peaches with honey lavender ice cream and almond crumbles, the American River College Culinary Arts and Hospitality Management program opened the doors of its four-star restaurant and famous bakery, the Oak Cafe, on Sept. 19 to offer a full package experience to students, faculty and Sacramento residents during this fall semester. The Oak Cafe restaurant, located by the court of parking lot D in the culinary arts building, is run by students enrolled in the Dining Room and Management class and culinary arts classes, giving them real-world experience running a restaurant, according to the Oak Cafe page on the ARC website. In the front of the house, on opening day, the tables were set, the atmosphere of the lobby, waiting area, dining and bar areas was calm and sophisticated. Student hostesses, the bartender and servers were prepared and confident after weeks of preparation for the opening day. Ike Khetani, culinary program major, said that his manager helped him with his first day nerves. Khetani said that after 29 years of being a certified public accountant (CPA), he can now make his dream of becoming a chef a reality. Inside the kitchen, the atmosphere was very different than the front of the house. 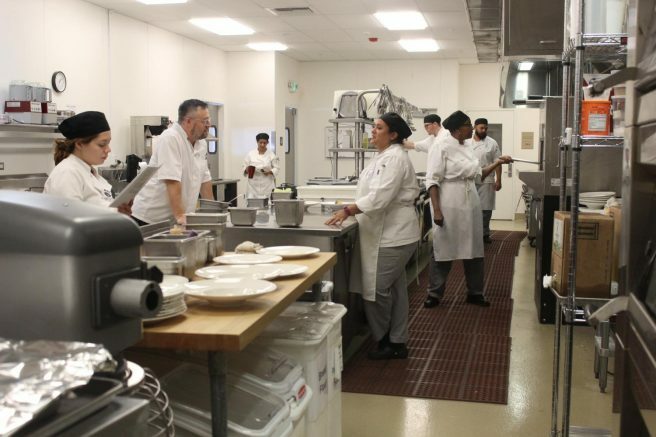 Khetani’s manager, assistant instructor J. Kropp, walked around the kitchen and dining room in rounds answering questions from the Oak Cafe crew, making sure everything was “perfect” by four star restaurant standards. A few eager students decorated a melon and jambon serrano entree with rose peppercorn, mint and olive oil, while other students oversaw the pizza margherita or the chocolate olive oil cake in the preparation areas. All nine students worked opening day in one of the biggest kitchens in which they can learn, according to Kropp. The kitchen room is almost the same size as the dining room, with specialized equipment, three big tables for preparation, two stoves, a grill area and a pizza oven. The whole restaurant was relocated and upgraded from a smaller location by the Kaneko Gallery to the new culinary arts building in February 2015. The old restaurant used to have a kitchen that was the size of the current dishwasher area, according to Kropp. Another addition to the restaurant is the bar area, which consists of a separate room from the dining area, with four sitting sets and a bar for non-alcoholic beverages. The bar was added during the construction of the new restaurant, and was funded by several donors. The bartender on the opening day was Phillip Bailey, hospitality management major, who said he was excited and having fun with the experience. According to Kropp, the bar offers italian sodas made by the students. 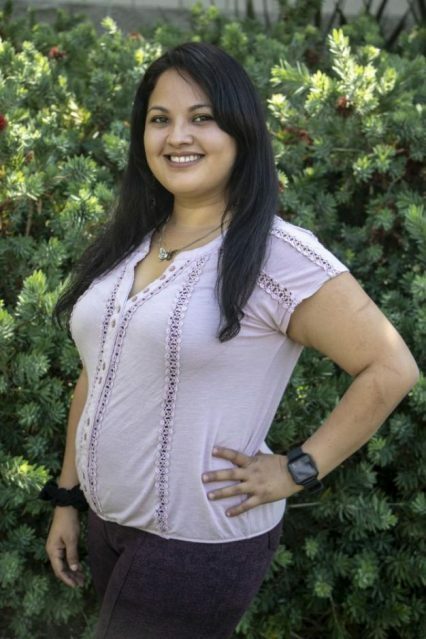 Students rotate different roles in the Oak Café to help them get exposed to every position as much as possible before graduating, such as being a host, server or bartender. According to Bailey, the crew of the restaurant had been meeting together regularly for the last month to rehearse proper etiquette and posture to go with the goal of the program; providing high quality service. “[It is about] making it inviting for the customer and letting them know we are here for them to provide to them a great experience and outstanding food,” Bailey said. The menu of the restaurant varies every week of the semester and is available on the Oak Cafe page, which list options for the following weeks such as a salmon burger and pizza with fennel sausage or eggplant. The Oak Cafe bakery is located in the same building as the Oak Cafe dining room and opened at eight in the morning for a big crowd of hungry students and faculty looking for a quick pastry with coffee on the go. Randy Moore, an instructional aid and bakery production manager for the Oak Cafe, said that the bakery is very popular in the community. The bakery opens at 8 a.m. but the students from the bakery production class and the advanced baking class start earlier to prepare for the day, according to Moore. 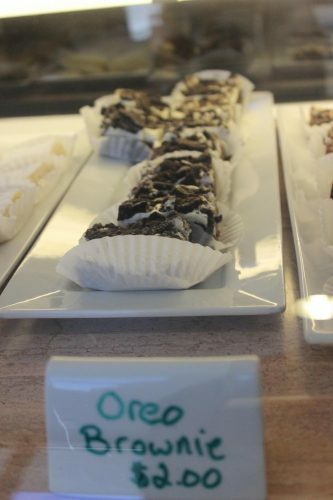 The Oak Cafe bakery offers affordable pastries and lunch choices that vary every day with coffee and tea choices. The bakery is open from 8 a.m. to 2:30 p.m. and doesn’t need reservations. The Oak Cafe offers lunch from Wednesday to Friday with seating starting at 11:30 a.m. to 1:30 p.m. until the end of the fall semester, call for reservations. Be the first to comment on "Gourmet etiquette and happy wallets; Oak Cafe reopens"